I thought I would share with you how I achieve this look and show you just Just how easy an every day look can be! I use the LA girl PRO conceal in Natural and I apply it to the areas I want to conceal, usually the broken capillaries near my lips, and any small spots I might have. I just blend this out with my finger. I then apply my MAC Studio Fix foundation in the shade NW20 with a flat top foundation brush (rose gold brush set) from Crush Cosmetics . I dot the foundation all over my face, and then in a stippling motion I blend it out over my face but avoiding the under eye area. I then blend this out with my e.l.f stippling brush. 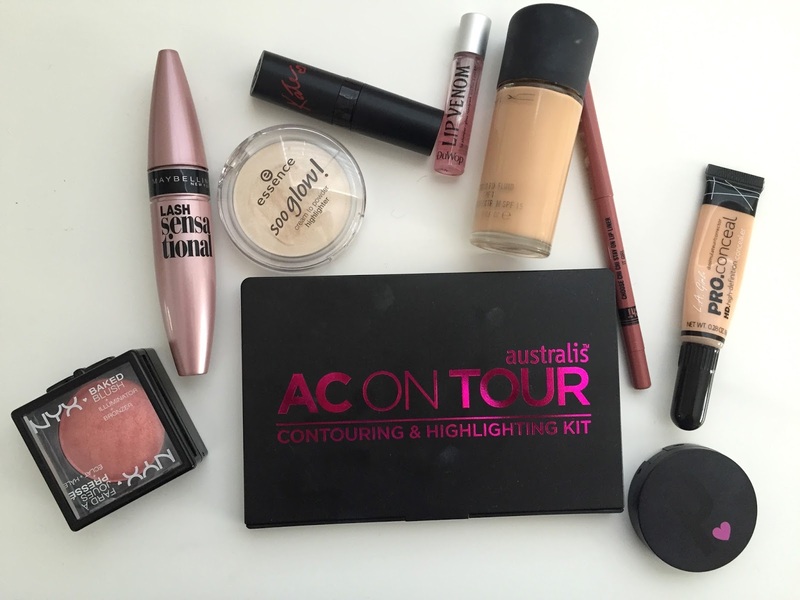 Using my Australis Cosmetics AC ON TOUR kit I take the "banana" shade on the small blush brush from the Crush Cosmetics rose gold brush set. I use this to set under my eyes in a dabbing motion. Next is my favourite part, the brow transformation! I have found my holy grail brow product, I literally can't use anything else (so far) that I like as much is the Poni Cosmetics brow dust in Thoroughbred! I use a very small amount on the angled eyeliner brush from the same rose gold brush set (can you tell I love it?). I carefully outline my brows, creating a defined arch and square off the beginning of my brows. Now that I don't feel naked, Its time for the eyes! First taking Baby Face on the Medium eyeshadow brush from the rose gold brush set, I applied that all over my eyelid and up to my eyebrow. This creates a base for the rest of the eyeshadows to blend out evenly. Once thats blended out, I took Frappe and used that with the blending brush from the rose gold brush set and blended that right into the crease line, being sure not taking it above the crease. Then on the small eyeshadow brush again from the rose gold brush set, I took Shimma Shimma and applied it all over the bottom lid. I didn't want this to go into the crease at all. 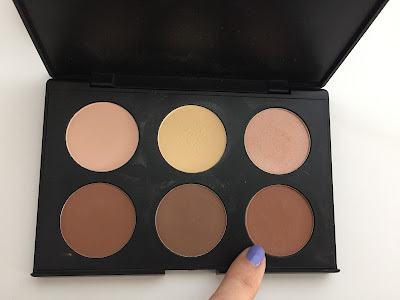 To blend it all out nicely I took the xo Beauty Round Top Blender and blended along the crease line again, using only what was left on the brush. For mascara I used the Maybelline Lash Sensational mascara, Its my current favourite! This is when I applied the highlighter, I like to wait and see how my eyes turn out to do this. I just dapped Essence Soo glow cream to powder highlight in "look on the bright side"
and on the bone area under my eye. Next is blush to make my cheeks pop! 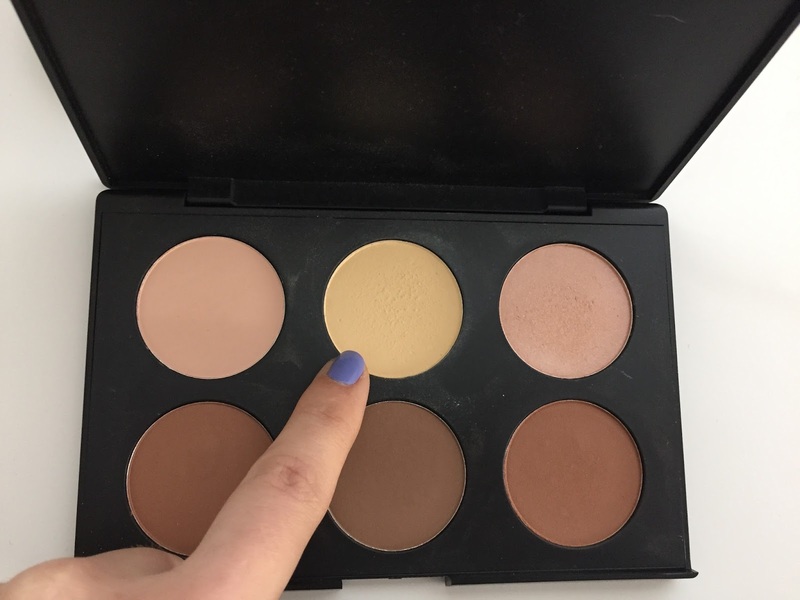 I used the NYX baked blush in "foreplay" on my xobeauty medium domed face brush and in light swirling motions move from the tops of my cheek bones down into the middle of my cheeks, not taking it too far come to my nose as you just want to define the mid section. Isn't it beautiful! I love the pink tones with gold flecks, its pretty much what i use every day! Lastly, but certainly not least, is the lips! This is really simple, I just took a nice shade. I chose the Rimmel, Kate Moss lipstick in "Rossetto" no. 38. I lined my lips first with the Chi Chi "It Girl" lip liner and then applied the lipstick. to finish the look off I used a Lip Venom by DuWop to add some fullness to my lips! I love this look for work, or when I don't have any thing specific to do and just want to freshen up my face. Whats your favourite everyday look? Link me to your blogs/youtube of any looks you have done!